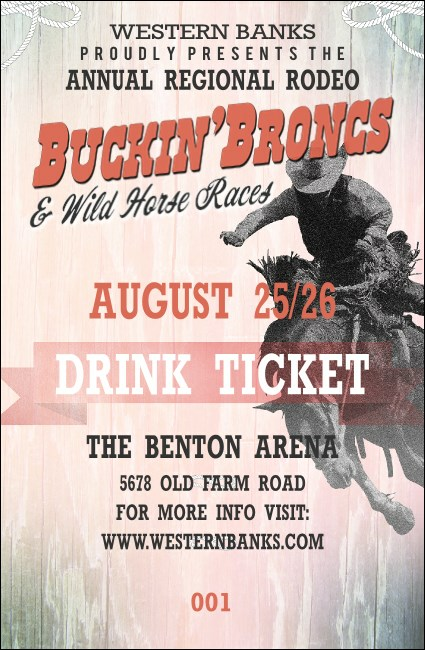 Let your guests break the barrier with a refreshing drink from the bar when you give them Bucking Bronco Rodeo Drink Tickets at your next event. These wild ticket templates feature a unique, light-colored wooden background design with a black and white image of a rider on his bucking bronco, and include numbering for extra security. Find the right ticket for any rider at TicketPrinting.com.